We have laid out some stunning walks around the estate all starting and finishing at the cottages. We have laminated sheets to guide you on each walk. The joy of having 2500 acres of private grounds with its wonderful wildlife , flora and fauna can be fully realised whilst enjoying these walks. A circular walk across the fields, passing through Badger territory. An easy walk for all the family, with the opportunity to see a badgers' sett, roe deer and red squirrels. For those wanting a bit more exercise, this circular walk covers all types of terrain, taking you along quiet country lanes, across fields and through woodland with lovely views to the coast. A lovely family walk through field and woodland to an ancient pele tower. A must for all history lovers. Stunning panoramic views from the top. Return the same way. A short circular walk from the cottages, past the old, ruined aircraft hangar. With lovely views across the fields and the front elevation of Doxford Hall. An easy circular walk to Doxford Farm and back across the fields. 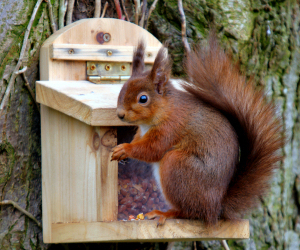 Red squirrel photograph © Lachlan Fraser, 2010.